As of today, this blog is a teenager. 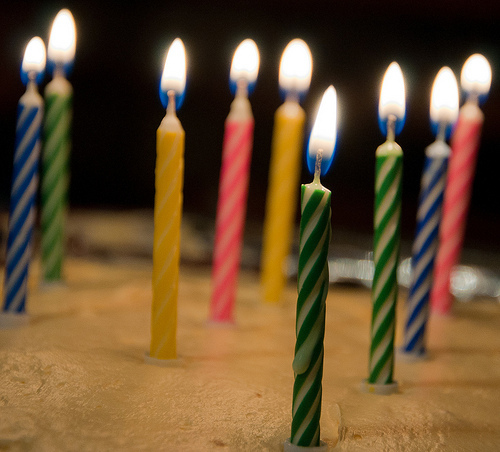 Thirteen years ago today, January 25, 2005, I started blogging at huffenglish.com. I always post on my blog anniversary, and usually, I share some statistics, but I’m not going to do that today. Instead, I’m going to ask for your help. If you have found this blog useful, and you want to pay it forward, I support these organizations and would be happy if you would support them, too. 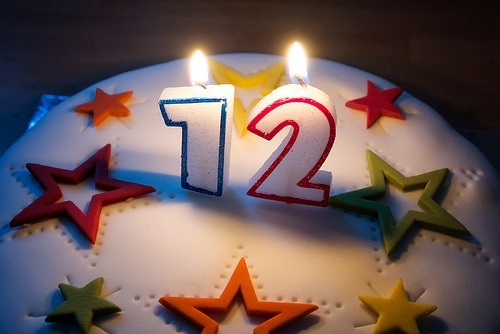 Today this blog is twelve years old. I originally envisioned this blog as a place where I could write about what I was thinking and where I could share my teaching ideas. It hasn’t changed a lot from that vision over the years, though posting has grown less frequent. I have been looking over some of the posts I wrote years ago, and it makes me wish I had a little more time to write—aside from summer, when I seem finally to be able to catch up and write. I just finished my twentieth year of teaching, and such an important milestone has made me a bit reflective. It’s hard to believe I have been blogging here for more than half of my career now. Sometimes I don’t even feel like I was a teacher before this blog. Perhaps because I wasn’t reflecting or journaling about teaching much until this blog, my memories of my teaching career up until this blog are fuzzier. It’s hard for me to articulate what this space has meant to me over the years. I have said it many times, but I’m not even sure I’d still be teaching if not for this blog because I no longer felt alone, and I was able to share what I was thinking with an audience who cared. Two years ago, when I wrote my tenth anniversary post, I thanked many supportive friends who helped me early on. I’m not sure what more I can add. Thanks to those of you who have been readers, whether for many years or a few days. I have written 1,086 posts on this blog. That works out to 90.5 posts a year or 7.5 posts a month. I have received 3,989 comments. That’s about 332 comments a year, almost one per day. I only have statistics for the last five years, but it looks like my best day for visitors was October 1, 2012. I can’t figure out how to drill down into the statistics and find out how many viewers that was. 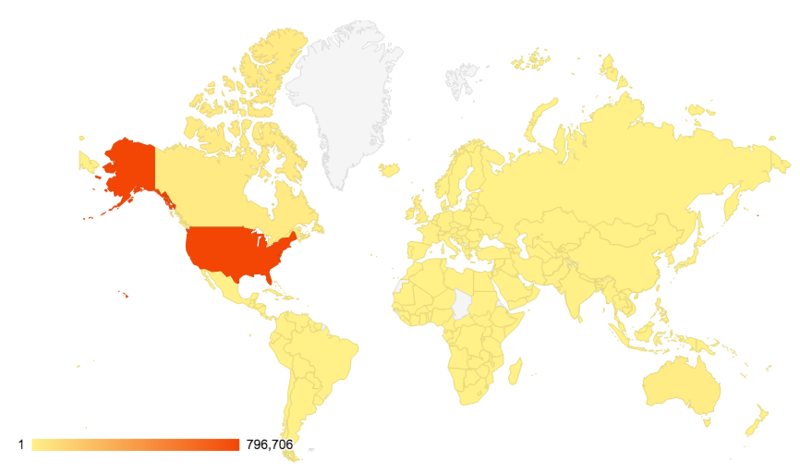 Most of my visitors today were from the United States, although I checked my stats for all time, and it looks like I have had at least one visitor from, well, almost everywhere. See below. The average number of views ranges from a low of 206 per day for this month of June 2017 up to over 1,000 per day in September 2012. I don’t have statistics older than 2012, but five years is long enough to have a fairly good range. I’m not sure if at one time, I had more views than 1,000 per day, but it boggles my mind that so many people were checking into this blog. Thank you! My blog gets the most traffic on Mondays. I have a combined total of 3,145 subscribers from WordPress and email. Thanks, and I hope I made subscribing worth your while. Since Google shut down Google Reader, I haven’t found an RSS reader I like much, despite trying a few, so I am afraid my own blog reading is really haphazard. I used to be so much better at checking other blogs. 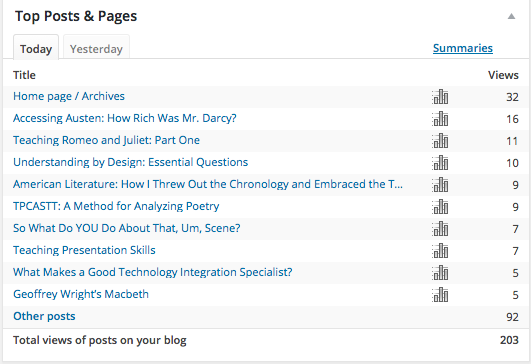 My most popular post describes how to use TPCASTT to analyze poetry. I didn’t come up with this technique, but somehow, my page is the #1 Google ranking when you search TPCASTT, which likely explains why the post is so popular. Plus it’s a really good tool, and I can’t take credit for it. Thanks to whoever invented it. My students still use it all the time. As of today, the post has had 47,243 views. The most popular posts seem to have remained pretty steady over time. Rounding out the top five (with number of views) are Understanding by Design: Essential Questions (41,856), Interactive Notebooks (33,325), Teaching “A Modest Proposal” (31,836), and Teaching Romeo and Juliet: Part One (29,253). Many of the most popular posts are among the oldest posts. I was going through blog posts I wrote almost ten years ago, and I noticed something interesting. Back then, blog posts—and I don’t think just mine, either—tended to generate comments. It was typical for my average blog post to receive at least two or three comments back then. I know one issue is that I don’t write often, so perhaps newer posts are not being seen. Then again, there are over 3,000 people who subscribe to this blog via email updates. I have often had someone leave a comment that mentions they have been “lurking” for years but never commented. I’m not bothered by the lack of comments, but I am curious as to why commenting happens less frequently now. It it just being too busy? Do people really still read blogs anymore? Despite predictions to the contrary, blogging seems to be thriving again, though it looks different now than it did when I started nearly twelve years ago now. The lower number of comments is something I am seeing not just here but also on other blogs I read. I am also seeing a trend I don’t really care for on social media, both on Twitter and Facebook, to made threads or longform updates. I suppose it’s your social media account, and you can do what you like, but I see Twitter and Facebook to be most useful for quick updates. Without this blog, I wouldn’t be the teacher I am today. I made so many friends through this blog. I learned so much and thought so much about teaching in this space. I was not as reflective as a teacher until I started blogging. Now I find I don’t even need to blog to reflect, which may be why I don’t blog as much as I want to. Back in the days when my boss was a bully, and I was contending with feeling like a failure as an educator, this space saved my self-esteem. I was validated by commenters agreeing with my ideas and challenged by those who didn’t. I needed this space to think through what I believed. I suppose I’m just curious about reading habits. Do people still read blogs? Why? 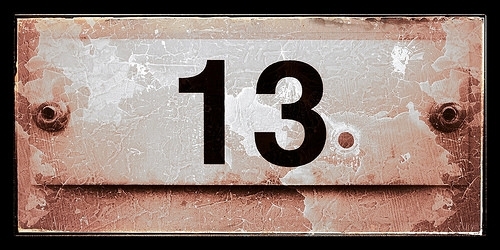 What do you think is behind the lower numbers of comments on blogs? 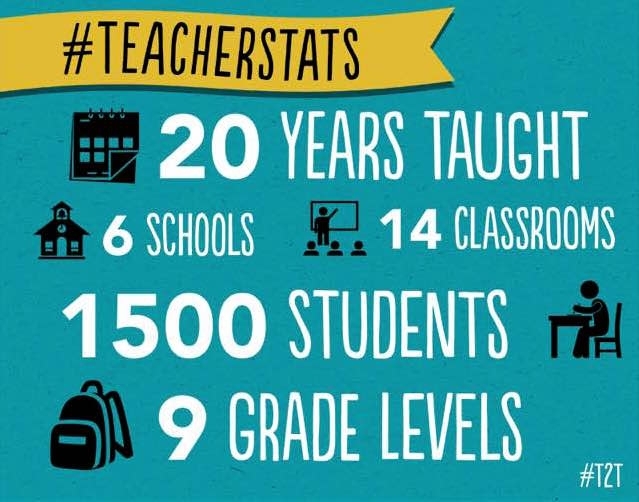 This month I finished my 20th year as a teacher. A few years into my career, I almost left it behind. I had finished my fourth year, and it was particularly bad for both professional and personal reasons. I had a really hard time finding a job. I finally found one about October—teaching preschool. The kids I taught that year are in college now, but I think of them often because they brought me back into the profession. Teaching them somehow rejuvenated me and helped me figure out why I do this job. For a while, I thought perhaps I had chosen the wrong age group and considered teaching younger children. I taught two years of middle school after that and went back to high school, this time in private school, and I never looked back. I have now spent 13 years teaching in private schools. I saw the above teacher stats meme going around, and I had to do some estimating, but the only figure I’m not really sure about is the number of students. I would estimate I’ve taught anywhere from 1,200 to 1,500 students. Some years in public school, I taught five sections and most of them had 20+ students, but I have now spent the bulk of my career teaching 4 or 5 sections with fewer than 18 students in each section (also an estimate, as sometimes the number is higher, and sometimes it’s lower… by a lot). As a ballpark, it’s not bad. Those faces come swimming back years later, even after I have forgotten the names. I wonder about many of those faces. Some have kept in touch with me. I was feeling quite frustrated a few weeks ago. You know how it is at the end of the year. Everyone’s nerves are frazzled, and we forget to be as kind and thoughtful as we should be. I include myself. I had a particularly draining experience toward the end as well, and I have to really thank my colleagues for their moral support at that time. It’s remarkable what difference some time, perspective, and rest can make. The ending of the year was particularly good for me, as my colleagues nominated me for a prestigious teaching award at my school, which in itself was a huge honor. My colleagues then voted among the nominees, and I was selected for the award. I can’t articulate what it means to me that my colleagues recognized me for my teaching, especially after I had been feeling so down on myself as a teacher. For those colleagues of mine who read this blog (and I know there are a few), thank you very much for such a tremendous honor. You really made my year. I wrote about ditching chronology for thematic design in teaching American literature, and I get emails about how it has gone, as the post is now old enough that comments on it are close. It has gone very well. I plan to write an update. One of the most enriching experiences of my career has been a collaboration with my fellow 9th grade World Literature I teachers and 9th grade World Civilizations I teachers (history). I want to reflect on that collaboration and share how we planned and what the year looked like. I brought home several professional books to read, and I will write reviews here once I’ve finished with them. I have now taught AP Literature and Composition for two years. I always contend it feels like year three is the year when things start to feel really good, whether it’s working at a school, teaching a course, or whatever else might be new and different. I have lots of thoughts about how this year went (much better!) and ideas for next year. I went to some excellent professional development at Harvard’s Graduate School of Education with three of my colleagues, and I haven’t written a thing about it on my blog. I am also becoming more involved with my local NCTE affiliate, the New England Association of Teachers of English (NEATE), and even though it’s early days, it has been great establishing local connections like I had in Georgia with GCTE. My students have done some great work this year, and I haven’t shared it. 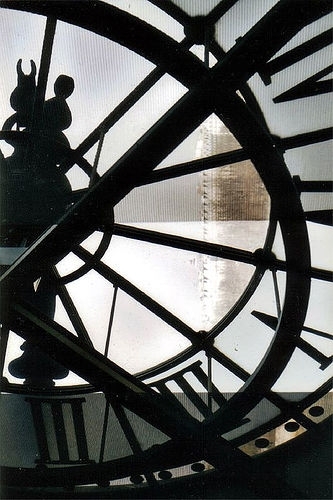 As E. T. Bell says, “Time makes fools of us all.” Months have gone by, and I haven’t written anything on this blog, but it doesn’t mean I haven’t been writing. I have actually taken up letter-writing again, and I have been trying to send letters somewhat regularly to my grandfather, who just turned 92 this last week, as well as two friends from school. I have been journaling. I published an article in English Journal back in January. While I haven’t been doing as much creative writing, I have been doing some reflective writing or other writing about teaching practice. I’m a firm believer that we make time for things that are important to us, and for one reason and another, it looks on the surface like this blog’s importance has diminished. After all, if it were more important (I reason to myself), I would post more. I’m forced to consider also, however, that despite much of the writing I’ve been doing offline, I’ve got writer’s block where this blog is concerned. I have often logged into my blogging platform, started a new post, and stared at the blinking cursor. Other times, something will happen in the course of a regular teaching day, and I will make a mental note to blog about it. But I don’t. Why not? By the time I find I have an hour or two to set aside to write about a topic, my own brain has moved on from thinking it over. I have a little notebook with a few ideas jotted down, but I find when I pull it out and look over them, thinking about what to write, nothing is grabbing my attention. In theory, the little notebook is a great idea. And yet, this blog, I know, is important to me. When I was recently at the Harvard Graduate School of Education participating in the Transformative Power of Teacher Teams, a professional development course for teachers aimed at making teacher teamwork more powerful, rewarding, and productive, I was asked to share what I was proud of in my career, and this blog was high on my list of accomplishments. I have been writing and reflecting (sporadically, yes) in this space for nearly twelve years. When my former host shut me down last year because they claimed my site was not optimized (and wouldn’t help me optimize it without my plunking down several hundred dollars, despite my having been a paying customer for a decade), I was not so much worried that all of my work would be lost, as I know how to back up my files, but I was worried I wouldn’t be able to figure out an affordable solution and that I would be offline for weeks. And in spite of not having updated, I didn’t want to be offline for that long. I know I need to make more time to be reflective here. This blog saved me when I felt alone, and I found others who shared their ideas and practices with me and who agreed with me. I didn’t feel so lonely anymore. It made me think about what I was doing and why. I am not sure I would have done presentations at conferences or written any articles for publication if I hadn’t had this blog first. This blog gave me some sorely needed confidence. It doesn’t work for me to schedule time, say, once a week to be reflective here (although it would be good for me if it did work) because I feel pressure, and I just get frustrated with myself if I can’t do it. I have always had to post when I can, when I’m inspired. I just wish that were more often. 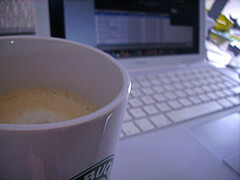 Those of you who blog, how do you keep your momentum going over time? 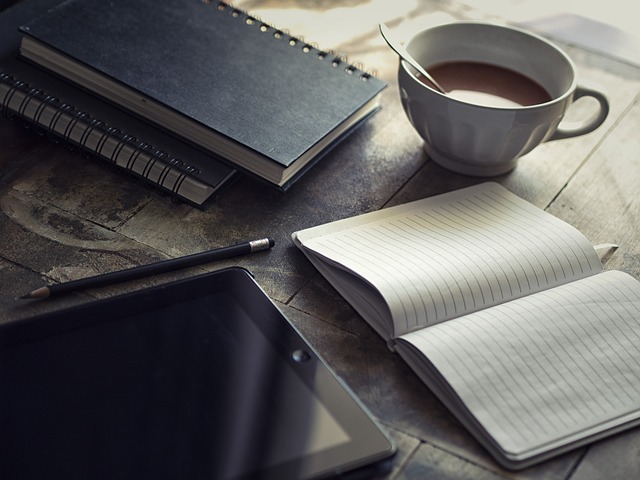 How do you encourage yourself to keep writing? 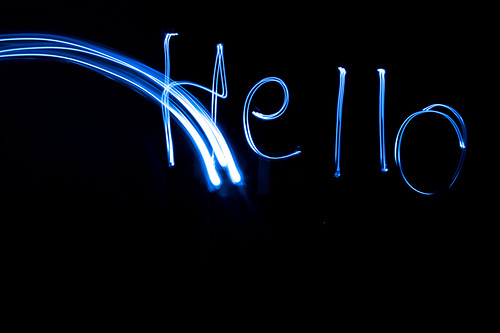 What do you do when the cursor is blinking at you? How do you start again? 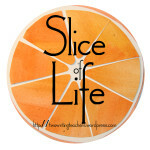 During the month of March, I will be participating in the Slice of Life Challenge. If you have been reading for a little while, you may have noticed that I try to participate in the Tuesday Slice of Life Challenge, which involves writing a post on Tuesdays. The March Challenge kicks it up a notch. Instead of writing on Tuesdays only, the goal is to write every day. I am not sure if I’m up to this, but I want to give it a try and see what happens. In any case, I am not going to beat myself up or pressure myself. Life happens sometimes. However, the goal is to try to post each day. I’ll see you tomorrow for the first post. During a discussion with students today over Robin Bates’s wonderful blog Better Living Through Beowulf, and its potential for ideas for their papers, a student asked me, “Don’t you have a blog?” I said, “Yes, I do,” and the students were curious. I told them where they could find it. In the early days of the edublogosphere, educators often blogged under pseudonyms or were discouraged from blogging at all. Many feared retribution over what they might post, and at that stage, blogging was considered a bit edgy. I have been blogging here for ten years now (eleven in June), and I can’t think of anything I would write here that I would be nervous about administrators, work colleagues, students, or parents reading. In fact, I invite it. I want the people I work with, the students I teach, and their parents to know I think a great deal about teaching, and blogging is a big part of that reflective practice. Blogging about my teaching has made such an immeasurable difference in my teaching career that it’s hard to say what kind of teacher I would be if I hadn’t started blogging. It was through encouragement on this blog that I tried just about every initiative in teaching, and each of the initiatives that has worked has made my practice that much better. In fact, I am not completely sure that I would still be teaching if not for the support and reflection this blog has offered me. When I began teaching at a school where that support and reflection was built into the expectations and culture (in comparison with other places I’ve worked), I admit I slacked off on posting, but I have yet to find any ongoing PD that has been as beneficial to me as blogging about what I am doing in the classroom. One result of keeping a blog for over ten years is that I have a record of a lot of the things I’ve tried in my classroom over the last ten years, including some of my earliest forays into using backward design in curriculum planning and assessing understanding with Socratic seminars (first ever mention was in my first year blogging; also see this older entry). I still plan using backward design, though I’ve learned that for me, the most important parts of the process are creating the essential questions using the UbD filter. On the other hand, I also have a long record of things I’ve abandoned. Not all of them are bad ideas or didn’t work, but for one reason and another, I no longer found them as useful or as big a priority. In some cases, people find these old posts, typically not regular readers of this blog, and occasionally I’m asked questions about how one thing or another is working out for me. Case in point? Interactive notebooks. I was really excited about them when I first heard about them. I think they are great in theory, but the problem I had was time to assess what students were doing in the notebooks coupled with frustration that students weren’t really using them to learn as I had hoped. So I gave up on them. As much as I like the idea of them, I found them a bit too unwieldy to manage in practice and my students weren’t deriving enough benefit out of them to make them worth the work for me. Perhaps it was a failing of implementation. If you are using them, and they are working for you, I’d love to hear how you’re making them work. Another experiment I couldn’t make work for me was Collins Writing. While I get that students work on certain issues as they go and eventually will cover a lot of ground, I never found it feasible to give feedback only a few things. I wonder if Collins Writing is something that might work better for teachers at the elementary and middle school levels than it worked for me. I don’t really use wikis with my students very much anymore, nor do I keep a classroom site or blog anymore. The biggest reason for this is that the school where I’ve worked the last four years has had a learning management system that will allow for online discussions and posting of assignments. In the past I have tried wikis, blogs, and Nings. The one thing I do need to figure out is publication. Students should share their work. Students in the eighth grade at Worcester Academy each have their own blogs, and I think it’s fabulous. It seems somewhat pointless, however, to duplicate information or assignments from the learning management system to some outside site, especially when my students’ other teachers are all using our learning management system. I would just be making things more difficult for the students. In any case, learning management systems, though they are often closed to outsiders, do allow for easy online extensions of learning. Some of these posts are old. Taking the home page or archives out of the equation, the most accessed page today was written in 2008. I still think it’s useful because it should give students an idea of how to understand money in Jane Austen’s books. The next most frequently accessed post was written in 2007. In fact, the most recent post in this list is the one entitled “American Literature: How I Threw Out the Chronology and Embraced the Themes,” which was written last March. The post “What Makes a Good Technology Integration Specialist” is often tweeted or otherwise passed around, but I’m not even a technology integration specialist anymore (I still stand by what I said, though). I wrote it in April 2012 when I was seeking a job in that field, and I considered it something of a manifesto as well as, I hoped, something that would attract a potential employer. Guess what today is? Ten years ago today, I wrote my first entry on this blog. I don’t know that I had a notion when I started this blog that I would keep it going this long. I didn’t think about it at all. I just did it. I had just finished my first year teaching in a private school. I started reading education blogs. At that time, most of the education blogs were written by ed tech folks. Very few classroom teachers were blogging. I am really excited to see that is no longer the case at all. 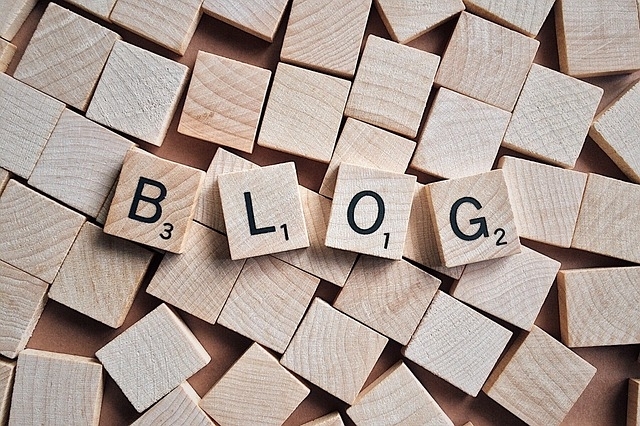 Teachers at all levels are now blogging about teaching, educational issues, their classroom, educational policy, and, yes, educational technology, and it is wonderful that they have that outlet so their voices are heard. 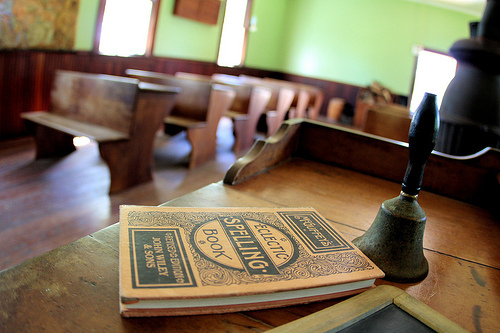 Do you remember what it was like before we could hear from teachers like we can today? How many of us used to sit in our classrooms, feeling alone? I know I did, which is part of why I started blogging. One of the things blogging has helped me do is be more reflective. I admit at first I started blogging so that I could connect with teachers like me. I was feeling pretty isolated, as I mentioned. Over time, it allowed me space to think about the craft of teaching, what I was reading, and what I was teaching in some seriously helpful ways. I can’t even tell you how many friends I have made through this blog. I don’t think I could honestly tally it up. It was such a wonderful feeling to meet up with these friends at conferences and know that I was no longer alone. Once I started teaching at a school that was more in line with my educational philosophy, I admit that I didn’t write as much here, mainly because I was supported and encouraged at work. It makes such a big difference. But it meant that I didn’t really need to blog in order to connect to others who shared my thinking. One thing I have realized just recently, however, is that this blog is really about the conversation. Sharing ideas. Committing to reflect. I say it like that because getting lazy about reflection gets me into trouble. I need to have some time to think, and the best way I think is through writing. When I was a relatively new teacher, I remember a teacher I worked with, a well-respected teacher whom everyone loved, spoke out when the superintendent visited our school. She let him know she disagreed with the fact that he was cutting PD and taking some of the management away from the schools. I still remember her saying, “In this county, we have a concept called site-based management.” I thought she was so brave. She wasn’t afraid she’d be fired on the spot, like I would have been if I had spoken. She didn’t care. It was worth speaking out because it was a problem, and he needed to hear about it. Even if he elected not to make changes, he would know he was not supported, and in that county at the school board was elected. I don’t remember that he actually stayed that long with us. In fact, I barely remember him at all. But I do remember my colleague standing up to him, and I have always wanted to be brave like her. She just recently retired after teaching the first grandchild of one of her students, which is quite an achievement. Over the years, I have spoken out about some topics that concerned me, such as the way we teach writing, or the way we put students off books, or censorship, or standardized testing, or homework, or any one of a variety of educational issues over the last ten years. I have been pushing myself to write more. It’s important for me to sift through my ideas and feelings here. One of the things this blog has helped me do, actually, is to figure out how I feel about educational issues and speak out about them. I need to do more of that than I have done in the last few years. Something I heard last week at a conference has resonated with me. I mentioned it before when I wrote about the conference, but now I’m seeing new applications. Rosetta Lee, one of the speakers at the conference, was speaking in the context of how we can be good allies. She said that when allies are silent, she can’t tell if they are silent because they agree with the comments or treatment that others received or if they disagree, but are afraid to say something. I have been thinking about that comment for a week now because it has so many applications. If we are silent about anything that is important to us, no one can tell what we are thinking. And sometimes that kind of thing is important to share. It might help someone. It might encourage someone. It might teach someone. But most importantly, it helps us because our voices are heard. Teachers need to continue to speak out about educational issues. I really do think it’s making a difference. Maybe not as quickly as we would like. But if we don’t speak out and share our ideas, how quickly would things change? We have a voice. We have the opportunity. I know you’ve probably heard like I have that the blog is dead. I don’t believe that. It’s easier than ever to start. If you haven’t started a blog yet, I challenge you to do so. If you have one, but you haven’t written in a while, or you’ve abandoned it, or you feel like you don’t have a lot to say, so you just don’t post a lot, I challenge you to resurrect your blog. It’s not easy to start. At first, not many people are reading, and it can be frustrating to feel like you’re talking to an empty room. But people will start reading. In fact, leave a comment and link to your blog here, and we’ll support each other. At the risk of sounding like a cheesy acceptance speech, I do want to thank a few people for their support of this blog. I want to thank Robert Talbert, who left the first ever comment on my blog and has supported me ever since. I think that comment may have disappeared when I had to migrate my blog from Movable Type to WordPress, as I can’t find it now, but I remember it. I also want to thank Glenda Funk, for pushing me to write and for commenting often. I am not as good as she is about supporting my friends. I want to thank Grant Wiggins for supporting the efforts of the UbD Educators in trying to create a wiki. It hasn’t really turned out like I wanted (which was no surprise to Grant, when I told him), but he didn’t have to support it. I appreciated that he did. I want to thank all the teachers near and far, who have come along over the years and supported this blog. I am afraid there are too many to list, and I am deathly afraid I’d leave someone out and hurt someone’s feelings, but it would be wrong of me not to mention several folks by name: Clix, who made so much effort to help me get the wiki off the ground; Nancy, who has been a long-time reader, commenter, and now a friend; Mike LoMonico, who brought me into the Folger fold; Bud Hunt, who gave me some personal attention when I changed fields (back in English again, though, Bud! ); Peter B-G, who is now a more local friend and has supported me by coming to my sessions at conferences; Buffy Hamilton, BEST LIBRARIAN EVER; Megan Hayes-Golding, who made friends with me at the first ever EduBloggerCon (I forget what they are calling it now, but it was nice not to feel alone in that room full of super techy folks when I was a new blogger). There are a lot of people who contributed to making me feel like I was worth listening to, and I appreciate you all very much. I first posted to this blog nine years ago today. My first post, in case you are interested, was a review of Constance Weaver’s book Teaching Grammar in Context. It’s not the most comprehensive or reflective review. I actually re-read a few of my early posts and cringed a little. I like to think I became much more reflective over time, and this blog is a big reason why. If I had not started this blog, I sometimes wonder if I’d still be teaching. I was in a frustrating position as a teacher for a very long period of my career. I learned a lot. One thing I learned is that there were people out there, people with whom I connected over this blog or their blog or later, Twitter, and they were going through some of the same difficulties, and they shared some of my opinions. It meant so much to have a source of validation. It can be so hard to teach on your own. It took me a long time to realize I was just not teaching in the right place. I’m so thankful that I am teaching in the right place now. However, I wonder—if I had not had this blog and the connections I made starting here, would I have been able to stick it out, or would I have made the assumption teaching wasn’t right for me rather than that I was just in the wrong place? So I am grateful for my blog because it is the first step I took into being connected to other educators, and it helped me find my voice, and figure out what I believed. I have not always been the most prolific blogger, and I know I don’t post often, but it means a lot to me that this space is always here for me. I’m also grateful to my blog for helping me reflect. Having an audience and space to talk about what I was reading, doing, and thinking really helped me grow as an educator. I felt myself becoming a better teacher as I began blogging. I taught for about six years before I started blogging, but it was after I started blogging that I became interested in integrating technology. I would never have thought, when I started teaching, that I would ever be “tech savvy.” I certainly didn’t think I’d ever have a real website or anything. Finally, I’m grateful for you, those of you who have read and sometimes commented. It helped me to know you were out there, somewhere, and that we could talk about whatever was on our minds, read books together, and share ideas.